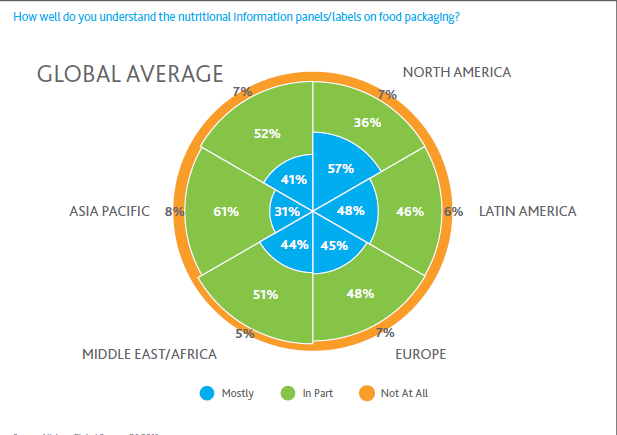 Via Fooducate, The Nielson company came out with a report about opinions on health food from people around the world. 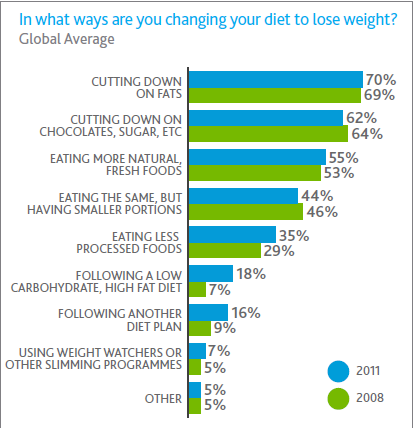 More people consider themselves overweight, with North Americans leading the way. 63% think they’re fat. The next highest is Latin America. The most popular method of dieting is cutting down on fat, followed by reducing junk food, followed by eating more natural fresh foods. Somewhat to my surprise, those attitudes seem pretty decent to me, with the exception that there’s too much of an emphasis on fat-cutting. That angle has a lot of caveats to it. Most people don’t understand food labels, including health claims. In general, well-defined measures like calorie and vitamin content are more trusted than vague health claims like “all natural” or “heart healthy.” Again, this makes sense, since vagueness is the friend of dishonesty and sensationalism. By and large that attitude is good, with the possible exception that an exclusive focus on the well-defined can create on a “forest for the trees” problem, which leads people to over-emphasize easily measurable statistics like calories or ORAC values that don’t always correlate with overall health. What “health benefits” sell the most? 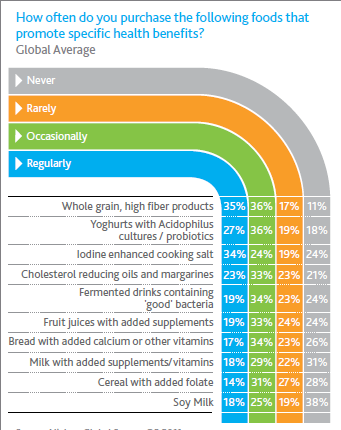 Whole grain/high fiber does best, followed by probiotics in bacteria. Among these claims, it’s important to understand the importance of nutrients from synthetic sources vs. nutrients from whole food sources. Absorption of nutrients from synthetic sources is typically very low, and sometimes their presence can even be harmful. There are a few long term studies linking multi-vitamins with increased rates of cancer. Not good. The fortifications added to cereals and fruit juices are not worth very much, especially molecules like Iron and Zinc, which need to have a particular ionic charge in order to be absorbed by the body. Overall though, I’d say this is evidence the world is wisening up. The general notion that most processed food is toxic at high dosage has more or less become common place, and overall perceptions of what’s healthy and what’s not is coming into higher resolution.